BIOLOGICALLY APPROPRIATE COMPLETE FOOD FOR DOGS. All dogs are evolved as carnivores possessing a biological need for a diet rich and varied in fresh whole meats supplemented with smaller amounts of fruits vegetables and grasses. That’s why Biologically Appropriate ORIJEN 6 Fish Dog features unmatched inclusions of whole saltwater and freshwater fish - caught wild within our region and delivered FRESH EACH DAY so they’re brimming with goodness to nourish your dog completely. 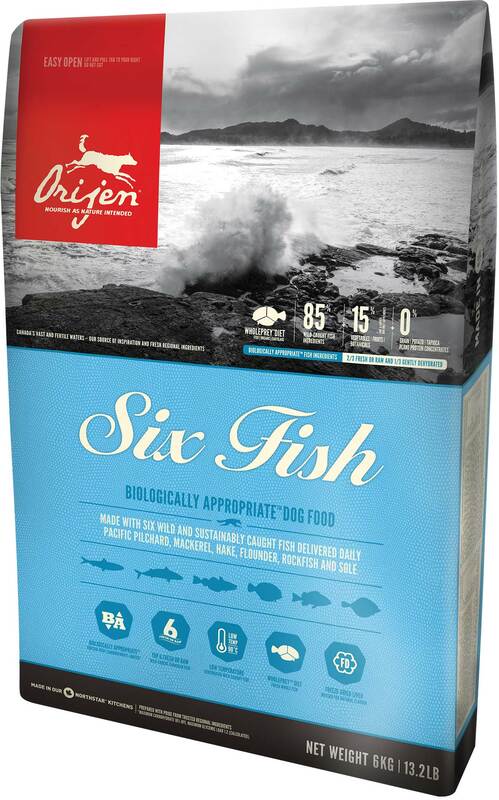 Prepared from Canada’s best and freshest ingredients in our award-winning kitchens; ORIJEN 6 Fish Dog keeps your dog happy healthy and strong. Read our ingredients and we think you'll agree! Inspired by the rich diversity of fish indigenous to our pristine waters Orijen 6 Fish features unmatched inclusions of saltwater and freshwater fish that are caught-wild within our region; packed on ice and whisked to our kitchens as fresh and cold as the waters they came from. Fresh whole salmon (14%); fresh whole herring (11%); dehydrated salmon (11%); dehydrated herring (11%); dehydrated Pollock (11%); fresh whole flounder (7%); fresh deboned walleye (3%); fresh deboned northern pike (3%); fresh deboned lake whitefish (3%); salmon oil (3%); herring oil (3%); chickpeas; red lentils; green lentils; green peas; pea fibre; canola oil; sun-cured alfalfa; yams; pumpkin; butternut squash; spinach greens; carrots; Red Delicious apples; Bartlett pears; cranberries; blueberries; kelp; liquorice root; angelica root; fenugreek; marigold flowers; sweet fennel; peppermint leaf; chamomile; dandelion; summer savory; rosemary; Enterococcus faecium. ME (calculated metabolisable energy) 3980 kcal/kg (478 kcal per 250ml cup) (120g). Calories distributed to support peak physical conditioning with 38% from protein; 21% from fruits and vegetables; and 41% from fat.